If not, please e-mail us. 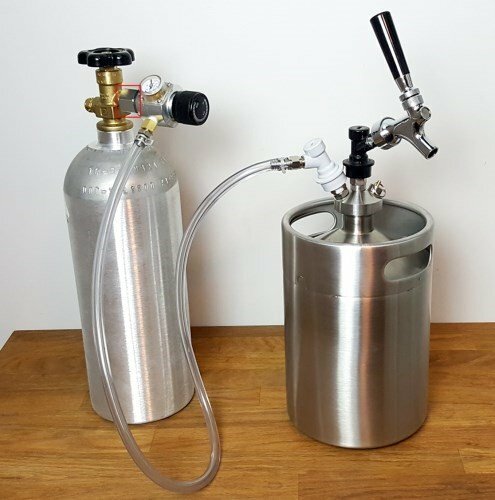 1）Can I force carbonate with mini keg or growler? Yes, it works as same as large system, such as standard beer keg in 30L /50L or corny keg. 2）What kind of CO2 cartridge should I use and how long does a 16-gram cartridge last? Please select threaded (3/8×24) 16gram CO2 cartridges. We recommend food grade, since food grade cartridges are cleaned more thoroughly during the manufacturing process. Those cartridges of non-food grade will have traces of oils in the CO2 that create an off flavor. A 16gram CO2 cartridge will dispense slightly more than two 64oz growlers if no CO2 is vented or leaked during usage. 3) Where can I fill my growler? You can fill the growler at your local breweries, brewpub and tasting room etc. 4) How to do cleaning and sanitising of the growler? 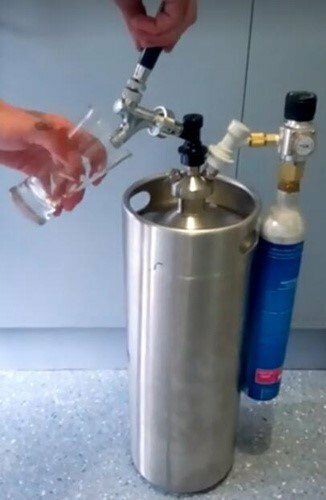 *Clean your keg or growler well before first use with hot water, if you notice any marks inside the keg these are usually due to residue left over from the passivation. If hot water doesn’t remove them try shaking some raw rice in warm water in the keg to scrub the inside. You can use sodium percarbonate to clean if you choose. It is also advisable to use no-rinse sanitiser just before filling. *We recommend cleaning your growler just with hot water if you use it every day and rinse as soon as it’s empty. Before you refill it use some no rinse sanitiser (2ml per litre) and leave it for 2 mins before emptying. Do not worry about remaining bubbles they are flavourless and non-toxic. You should also clean it well before using it the first time. *If your keg has been left with beer in it, has yeast caked on or has visible dirt then use some sodium percarbonate cleaner. Dissolved in water this breaks down deposits and is safe to use on steel, aluminium and copper. It breaks down to a non toxic, flavorless liquid however it is best practise to clean using this then still rinse and sanitise as above. 5) Is the growler dishwasher safe? No, we recommend hand wash to last a longer lifetime of mini keg and growler. 6) Is the growler water resistant? Yes the growler is water resistant. We don’t recommend submerging the regulator and gauge in water, as it may damage the regulator. 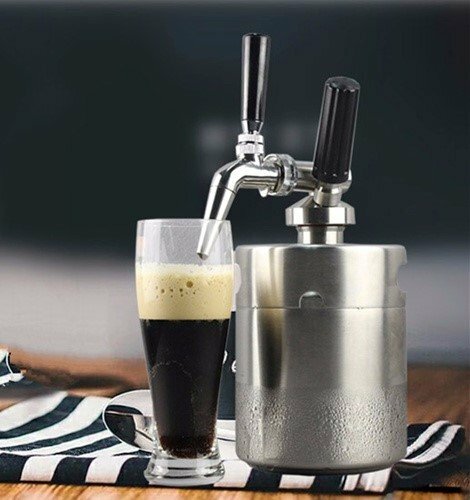 7) Can the growler system be used for other carbonated beverages? 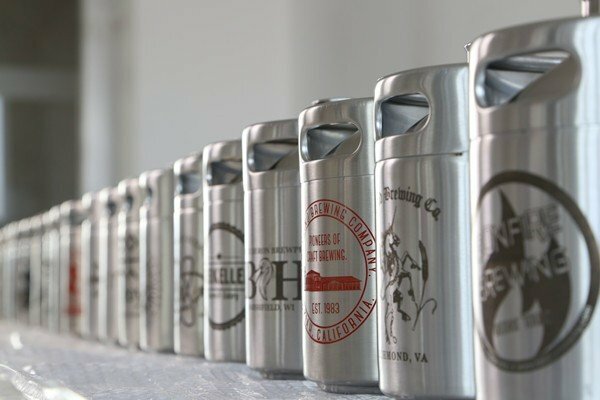 Yes, the growler system can be used for other carbonated beverages, such as coffee, soda, kombucha, juice, cocktail, apple cider etc. 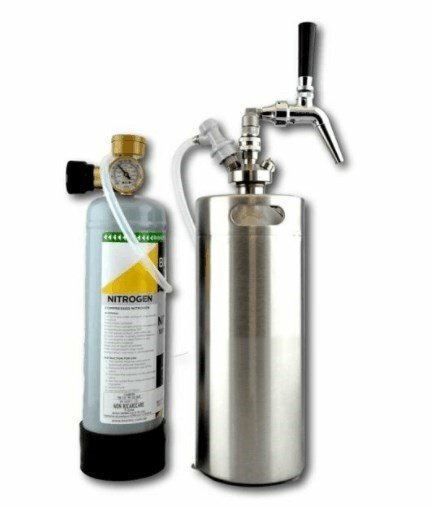 8) Can the growler system use nitrogen? You can use nitrogen for stout beer. We also have a special coffee dispensing system to use 8g nitrogen cartridges. 9) Can the growler system be used for non carbonated beverages? Yes, however it will be best to use a nitrogen cartridge and keep the pressure low. 10) Where can we buy CO2 cartridges? For large qty, you can buy from your local homebrew shop. 11) Does the regulator display working pressure or tank pressure? There is a one way check valve in between the tank and the regulator designed to prevent liquid from entering the regulator, just like a keg draft system. 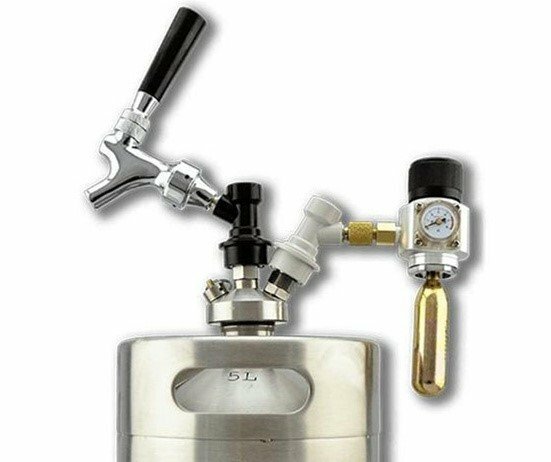 The gauge will read the pressure at the regulator, which will generally be the same as the tank once the keg has been charged with CO2. 12) How long does mini keg keep beer fresh and carbonated? 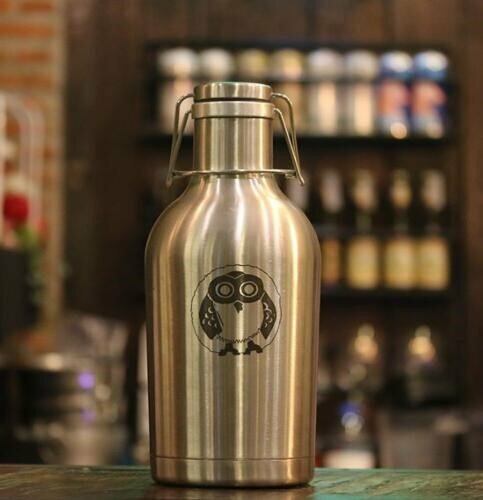 13) Can I put my company logo on growlers? Absolutely. Pls. send us your VECTOR logo artwork by PDF, AI or EPS format, and then we can choose suitable logo printing method for you. Currently we can do silk screen/etching/laser engrave/powder coating on the growler. There will be an additional cost associated with this and we may require a minimum order. 14) Can I use my own CO2 tank and regulator? Yes, simply remove the regulator and connect the CO2 line to the grey ball lock connector/SS twist tube. 15) What are the differences between the picnic tap and metal tap? *The Picnic Tap is an awesome, on-the-go system. It’s perfect for picnics and BBQs, tailgating, or to join you on your favorite outdoor activity, like hiking, camping or tailgating. 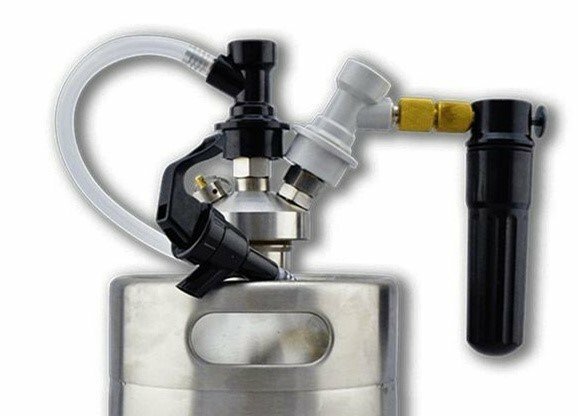 Our staff has also found it works great to lay the mini keg tapping system on its side in the fridge and swing out the tap to pour—no need to even pull out your system. *The Metal Tap looks just like those you see at your favorite brewery. It works great from the door of your fridge and has the experience-factor that just makes you feel amazing when pouring at a party. Its revolutionary ball and floating front seal design prevent your beer from being exposed to air, keeping your beer fresh! Definitely. We have patents of the tapping system. 17) Can you ship CO2 cartridge to us? The CO2 cartridge belongs to hazard product, so can not shipped by air. If shipped by sea, then we can supply. Suggest you can also source CO2 cartridges locally. Pls. Check the regulations in your state (USA), Sinobartool is not liable if your purchase does not comply with your state regulations. 19) What is sample time and production time? 20) What payment method do you accept? We are quite flexible about payment, we accept T/T, Paypal, Western Union, Trade Assurance, L/C etc. 21) What is your sample policy? We can send samples for testing before ordering. You just need to pay sample cost and freight. 22) What business term can we choose? EXW, FOB, CFR, CIF, DDU. Sometimes DDP is also available. 23) I am getting a lot of foam when I dispense, how do I correct this? Different beers have different dispense pressures. If you’re getting foam, start by dropping the dispense pressure to around 2~3psi. You may also need to let the beer settle if it has been shaken recently (during transport). As well, if the beer has been stored at a higher PSI (store an IPA at 15psi over night, you’ll have a lot of foam), the beer could be over carbonated.